 The History of the Term "Expressionism"
Winter Landscape (1909) By Kandinsky. By the Fauvist Maurice de Vlaminck. Expressionism was certainly not a school, in the sense that it was not a question of a number of artists forming a group on the basis of a specific program and devoting themselves to the same techniques. Rather, expressionism represents a state of mind which, in the intellectual field, has affected not only poetry and painting, but also prose, architecture, the theatre, music, science, university and school reforms. Accepted pioneers of expressionism include the autobiographical painter Van Gogh (1853-1890), the symbolist Paul Gauguin (1848-1903) and the primitivist German portrait artist Paula Modersohn-Becker (1876-1907). The History of the Term "Expressionism"
The problem before us is how to define the term expressionism, and to find out how it came into existence. Many writers maintain that it entered Germany via Willhelm Worringer, the author of Abstraction and Empathy, who, it is claimed, used it for the first time in 1911. Others, by contrast, grant this honour to the art dealer and editor Paul Cassirer (1871-1926), who, in 1910, is said to have announced, in front of a picture by Max Pechstein (1881-1955), in answer to a question as to whether this was an example of Impressionism, that it was an example of Expressionism. As a result of this quip, the term is said to have come into vogue in artistic circles, before spreading into the news columns of the journals. In their concern for accuracy, researchers have sought to go further into its etymology. Armin Arnold has shown, for example, that in July 1850, an English newspaper, Tail's Edinburgh Magazine, mentions in an anonymous article an expressionist school of modern art, and that in 1880, in Manchester, Charles Howley devoted a lecture to modernism at the heart of whom he identified the expressionist painters, using the term to describe those whose intention it was to express their emotions and passions. In the United States, still according to Armin Arnold, in 1878, a group of writers calling themselves expressionists appeared in a novel by Charles de Kay, The Bohemian. In fact, this Anglo-Saxon usage is far from corresponding to a description of a clearly defined style or of a specific artistic tendency. The same is true in France, where the mediocre and largely forgotten painter Jules-Auguste Herve exhibited, under the heading Expressionnismes, eight of his paintings at the time of the Salon des Independants in 1901. Obviously, the word was coined with reference to Impressionism and as a reaction against it. But, contrary to what has often been suggested in Germany, it remained just as uncommon in the vocabulary of everyday French as in art criticism. Its use has remained all the more exceptional because Jules-Auguste Herve has left no memorable mark on the history of French painting. Moreover, the use he made of the plural instead of the singular suggested that he was not thinking of promoting it as an aesthetic movement. See also: History of Expressionist Painting (c.1880-1930). Justifiably, therefore, in 1919, in the journal Das Kunstblatt, the famous art dealer Daniel-Henry Kahnweiler (1884-1979) attacked the idea which was spreading throughout Germany, that expressionism was of French origin. This notion, he emphasized, was not in use in France and was completely foreign to the fine arts. He knew what he was talking about because, as a passionate promoter of new talent, and one of the most influential art collectors, he was embedded to the hilt in the Parisian art world. This concern for accuracy was dictated to him by the desire to dispel the confusion that was distorting all aesthetic judgement. He was replying in particular to Theodor Daubler, who almost went as far as establishing Matisse (1869-1954) as the authentic leader of expressionism, and who claimed, no doubt confusing the term with Fauvism, for which he was indeed responsible, that the critic Louis Vauxcelles (1870-1943) was the originator of this new description of Matisse. In fact, Theodor Daubler's allusion to Matisse was not totally without foundation. Mentioning the name Matisse as a way of describing the direction that German painting had been taking for some time, is to recognize in it certain traits of which he was indeed the precursor after he had broken away from Neo-Impressionism: a work does not copy nature; it is a rejection of all constraints; it is irrational and emanates from the temperament of the creator, in opposition to the pretensions of the positivists and the scientists; it embodies a relationship with colour which is aggressive and commanded by an unknown force. Moreover, whereas in Berlin, Matisse had the right during the winter of 1908 to the first important exhibition of his works in Germany, Kunst und Kunstler published in 1909 his Painter's Notes, which had appeared in the Grande Revue in December 1908. Here he claimed to be individualistic and subjective, and wrote, "what I am looking for above all is a means of expression." It is not impossible that this admission by Matisse, although it is accompanied by other statements which are rather incompatible with the aspirations of German painters usually described as expressionists, led to the formation of the generic term expressionism. But the arrival of the word on the public scene occurred neither through a borrowing from English-speaking countries nor through a reference to Jules-Auguste Herve or Matisse. The opportunity arose through an exhibition: the Berlin Sezession, which took place from April to September 1911. Under the direction of Luis Corinth, its Impressionist tradition was continued, but, unusually, a group of new French painters were invited. Assembled in one room were pictures by Andre Derain (1880-1954), Kees van Dongen (1877-1968), Raoul Dufy (1877-1953), Orthon Friesz (1879-1949), Henri-Charles Manguin (1874-1949), Charles Camoin (1879-1965), Albert Marquet (1875-1947), Pablo Picasso (1881-1973) and Maurice de Vlaminck (1876-1958). They were introduced in the catalogue as expressionists. It is undeniable, however, that as a result of the articles and discussions on the new art, whether French or German, a series of aesthetics took shape. Beginning with no more than an imprecise term, expressionism became more clearly defined thanks to skirmishes between two distinct tendencies, traditionalism and modernism. When the traditionalist Carl Vinnen raised his voice against the invasion of German galleries by foreigners, Wilhelm Worringer replied in Der Sturm, in August 1911, by showing that the expressionists (he too was describing the French painters who exhibited at the Berlin Sezession) did not begin in a void, but had inherited anti-Impressionist techniques (today lumped under the term Post-Impressionism) from Cezanne (1839-1906), Van Gogh (1853-90) and Matisse. This approach allowed French and German painters who represented the new art to be linked together without discrimination. All those who reacted against the Impressionist idiom were labelled expressionists. Only those who no longer wished to represent, copy or imitate reality counted. In a book written in 1914, the Austrian writer Hermann Bahr therefore included, as forming part of the expressionist movement, Matisse, Picasso, the Futurists, Fauvists, members of the avant-garde German groups Die Brucke and Der Blaue Reiter, as well as the Viennese portraitist and landscape artist Oskar Kokoschka (1886-1980) and the drawing master Egon Schiele (1890-1918). 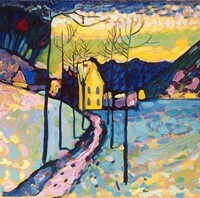 With the exception of a few names, this image of expressionism remained valid in Germany. Someone who greatly contributed to propagating this, as director of the journal Der Sturm, namely Herwath Walden (1878-1941), wrote a history of expressionism: at the beginning, he says, came Kokoschka, then Futurism, especially Umberto Boccioni (1882-1916), then the expatriate Russians Wassily Kandinsky (1866-1944) and Marc Chagall (1887-1985), the Germans Franz Marc (1880-1916)and August Macke (1887-1914), the Swiss fantasy painter Paul Klee (1879-1940), and the Frenchman Robert Delaunay (1885-1941). For him, expressionism was art which gave form to the lived experience that lies deepest within oneself. The nuances of style were not important, as long as all imitation of nature was rejected. For "imitation can never be art, whether applied to pictures or nature," is how Walden sums it up in his preface to the catalogue of the autumn Salon that he organized in Berlin in October 1913. And a little further on he describes the creative process as he saw it: "what the painter paints is what he perceives in his innermost senses, it is the expression of his being; all that is transitory is for him only a symbolic image: his own life is his most important consideration: what the outside world imprints on him, he expresses from within himself. He conveys his visions, his inner landscapes, and is conveyed by them." From then on, all artistic creation had to be the projection of the artist's profound self. It is this opposition to Impressionism and more generally to naturalism that appears as the keystone of the new aesthetic. That is first and foremost what expressionism means. Herbert Kuhn, in an article on the theatre published by the journal Die Neue Schaubuhne in 1919, clearly showed the fundamental principle on which creative activity now rested, whatever its form of expression might be. "The aim of Impressionism was the object it represented: what he could see on the picture was also the meaning of the picture. Nothing more. Nothing less. With the imitation of something external, its universe was restricted to what was concrete. With expressionism, the subject to be represented and the object itself, the representation, were fully dissociated from one another." The work no longer took external reality into consideration, but advocated another reality, namely, that of the artist. Already in 1912, Carl Einstein, the author of the novel Bebuquin, had insisted on this in the journal Die Aktion by indicating that the role of art was to achieve a liberation from everything that everyday reality imposed (the incidental, psychological and logical) and to accomplish, thanks to individual creative and imaginary impulses, reconstruction. For the expressionist, as Kasimir Edschmid also explained in 1918, the real reality lay inside oneself: "Nothing can place in doubt the fact that what appears to be external reality cannot be authentic. The reality must be created by us. The meaning of the object is to find out what lies beyond its appearance. One cannot be content with believing in a fact, or imagining or registering it. One must give a pure, unblemished reflection of the image of the world. And this is only found within ourselves." Expressionism therefore gained momentum as an opponent of Naturalism. Whether it be the inner need to create, advocated by Kandinsky, the interiority demanded by Emile Nolde (1867-1956), the illogicality that Carl Einstein wanted to make the only law in his Bebuquin, the instinctual forces in short stories like Carl Sternheim's Busekow or Alfred Doblin's The Assassination of a Buttercup, Oskar Kokoschka's violence in Murderer, the Hope of Women, a subjectivity posed as an absolute emerged everywhere, as an expressive exteriorization, or a defence of the self. It was less and less a question, as in naturalism, of a preconceived idea to illustrate, or of a subject to convey, a model to reproduce or of an external motivation. To give preference to the expression of subjectivity by rejecting all intention of fidelity to concrete reality pre-supposed that two essential elements were taken into consideration by the creator: the heart and the intellect, and no longer the senses as with Impressionism. This resulted in considerable differences in the means of expression available, but from which two approaches emerged, depending on whether priority was given to one or other of these two elements: an art of intellectual elaboration, sometimes described pejoratively as cerebral, and an art of sentimental effusiveness. This is also why the two extremes fused in expressionism. There was a purifying of the forms to create an expressive symbolic rigour, as if the language had become overburdened with an infinite variety of possibilities. This distinction is indeed only approximate, and cross-fertilization took place between the two approaches. However, they constitute, in the context of all the arts, the particular situation that existed in Germany between 1910 and about 1925. In the first instance, its ultimate aim was abstract art. This is what was defined by Oswald Herzog in Der Sturm, in 1919, as abstract expressionism. "It is the physical configuration of what is achieved at a spiritual level. It creates objects but does not begin with objects - but with subjects. The object, for material expressionism, contributes to the configuration. It distils the essence of a subject by rejecting everything that is not essential to its purity and intensity." From this, one can discern an approach that defines Kandinsky's pictorial and theatrical experiments, August Stramm's poetic analysis, Lothar Schreyer's drama, Emil Pirchan's theatrical sets, and some of Hindemith's music. In drama, the rejection of psychology led to more or less abstract characters who above all embodied ideas. In every field, to achieve maximum expressive force, forms and lines were purified to excess. The legacy of French and Belgian symbolism, as a reaction also against naturalism, needs to be noted here. (The impact of Gauguin's symbolism on the French and German avant-garde, for instance, as a result of his 1906 retrospective at the Salon d'Automne, was enormous.) Pure painting, pure music, pure poetry, as Walden's circle and Der Sturm enjoyed insisting, were demands in the symbolist tradition and which led to the elimination of the object in order to concentrate the artistic activity on a particular material. It is through a stylization carried to the extreme that its power of suggestion, which was the fundamental element of the symbolist aesthetic, culminated in abstraction in Kandinsky's ideas for the theatre. He also claimed to have painted his first abstract composition around 1910, and reached a stage where he read the symbolist poets assiduously. The other trend corresponds more to an explosion of suppressed violence. In art, there were convulsive grimacing traits and distorted forms. It consisted of a pathos, an exaggeration, the cry of revolt, the ecstatic enthusiasm of poetry; a theatre of paroxysms and haranguing; a morbid climate, an atmosphere of anguish, a universe of tensions. In 1924, the bilingual French-German poet Yvan Goll (1891-1950) only expressed part of this side of expressionism, when he described it as "an impotent man's fist clenched against the firmament in a fury." It was not always grotesque and desperate. It was also represented, in a style reminiscent of African art, by a wood-cut by Conrad Felixmuller (1897-1977), where man, standing upright in all his original purity, brandishes in a Promethean aspiration, the ideal of humanity. In 1913, the journal Die Weissen Blatter tried in fact to encapsulate this aspect of expressionism in the following definition: "Concentration, economy, massive force, forms solidly assembled, a pathos expressing an intense passion, these are the characteristics that reveal its real nature." As for the art critic Wilhelm Hausenstein, he regarded it with a touch of irony: "In expressionism there is as it were an overloaded circuit, which is perhaps a diagrammatic representation of it. One could define it approximately in this way: a form created out of distortion. This would be a negative judgement. More positively, one could say, a form created out of the imagination." It is through this art of distortion, deformation, exaltation, exacerbation, and intensive expression that individual styles generally received the mark of expressionism. And as this created a problem of terminology, particularly with regard to visual art, it is possible to maintain, that there is in fact, a universal and timeless expressionist style which is by no means the attribute of a specific historical period in German-speaking countries. Being nothing more than the projection of an inner world through expressive traits, expressionism is clearly discernible even in prehistory, in African sculpture and Oceanic art, in painters like the intense German Matthias Grunewald (1475-1528) and the distortionist El Greco (1541-1614). In this way, a great part of Western music also becomes expressionist, simply because it is expressive. But the term expressionism ends up by meaning only a stylization and distortion, and an oppressive simplying of forms. It has just as much conceptual significance as attributing the term to a young painter today, on the pretext that he transmits on to the canvas the reality he perceives according to his impressions. As soon as one tries to define a style without taking into account its historical context, the terms of reference become so unclear that it is impossible to be accurate. The differences in the various interpretations of expressionism are very often explicable through ignorance of concrete national situations and a desire to reject all historical considerations. Now, as we have previously shown, the word expressionism only really became fully part of the artistic climate in Germany, where it initially meant the discovery of all modern art, before assuming a meaning adapted to the historical situation in Germany. If one only considers the formal aspect, which is a very dubious approach in this particular instance, the same aesthetic innovations were given different names in other countries. This is why, from one country to another, and with reference to the same pictures, certain painters who were either actually German or closely linked to Germany (Jean Arp, Lyonel Feininger, Otto Freundlich, Erich Heckel, to name but a few) are alternately classified as Expressionists, Cubists, Cubo-Expressionists, and sometimes as Dadaists or Surrealists. In Russia, artists who are normally called Futurists have been described as Expressionists. The term here seems to refer without discrimination, as in Germany, to all artists representing modernist tendencies. Lunacharsky, the first People's Commissar for Public Education in the Soviet Union and a distinguished authority on German literature, bestowed on Maiakovsky in the 1920s the title of the most typically expressionist poet. In the Belgian review L'Art Libre, in 1919, an article by David Eliasberg, translated from the Russian, announced that the Soviet Government had wholeheartedly adopted expressionism and all the teachers in the art academies had been replaced by expressionists. A Soviet critic, G. A. Nedochivin, did not hesitate to write, in the 1960s, that the label of Futurists attached to Mikhail Larionov (1991-1964), Natalia Goncharova (1881-1962) was inadequate, and that they were much closer to the German expressionists than to exponents of Futurism like Gino Severini (1883-1976), Carra (1881-1966) and Filippo Marinetti (1876-1944). As far as France is concerned, as we have already said, the concept of expressionism remained unknown for some time. Imported from Germany in the inter-war period, it had to be adapted to the French situation and be given a pictorial meaning among existing categories. Expressionism could not be either Futurism or Cubism, nor Orphism nor Surrealism. Moreover, anti-Germanic feeling was so strong that the cultural output of German-speaking countries was often misunderstood or denigrated, and no acceptable definition of the movement emerged. Klee was exhibited for the first time in Paris in 1926 at Aragon's instigation, and the Swiss Surrealist was greeted as a German who could not draw! The use of the word tended to spread in painting to include expressive art, and Andre Lhote in 1928, in the Nouvelle Revue Francaise, spoke up against this practice. One of the first exhibitions where the term was used to describe French painters took place in Paris at the end of 1935, under the aegis of La Gazette des Beaux-Arts. Devoted to 'instinctive painters', it had as a sub-title 'birth of expressionism'. Whom did it include? Pictures by Marie Laurencin (1883-1956), Modigliani (1884-1920), Jules Pascin (1885-1930), Maurice Utrillo (1883-1955), Chaim Soutine (1893-1943) and Chagall were gathered together. In the introduction to the catalogue, German Expressionism was said to date back to Marc Chagall (1887-1985) (! ), thus crediting him with bringing together German and French expressionist styles. "An important exhibition of his work, mounted in Berlin in March 1914, on Apollinaire's recommendation, had a great impact - and this was the beginning of German expressionism." As proof of this legendary status as the originator of expressionism, reference was made to his memoirs and to an extract from a letter by Ludwig Rubiner, who wrote to him from Berlin before the declaration of war, saying, "Do you know that you are famous here? Your pictures have created expressionism. They are selling at a very high price." Examples of Parisian expressionism include: Portrait of Juan Gris (1915, Metropolitan, NY) and Jeanne Hebuterne (1918, Metropolitan) by Modigliani; Portrait of Madeleine Castaing (1928, Metropolitan) by Chaim Soutine; and the Green Blouse (1919, Metropolitan) by Pierre Bonnard. In spite of its confusion, one aspect of this exhibition should be remembered: the instinctive side that is attributed to the expressionist style. More and more, this style was characterized by the exteriorization of the painter's impulsive reactions to life, and less concerned with the elaboration of pictorial material and forms, than with the expression of his deepest inner feelings; the expressionist painter himself became the creator of an art of anxiety, unease, neurosis, and apocalyptic threats, in short, an art of fantasies which were projected in the form of a creative spontaneity. Whatever the method of painting, external reality was sacrificed to the benefit of its internalized image. This view, which now predominated among French art critics, was not entirely foreign to the doctrine of German Expressionism, although it is not an adequate description of it. Above all, because of its general nature it allows one to classify painters who are difficult to include in other categories, and who are only seeking an outlet for their repressed feelings, their emotions and passions. It allows one also to describe as expressionist, artists whom one had not been able to, simply because the word did not exist, such as: Edvard Munch, Vincent van Gogh, the Belgian James Ensor, and the Fauves. In the case of the latter group, the person who coined the term at the autumn Salon of 1905, namely Louis Vauxcelles, varies his terminology: in 1958 in a book on Fauvism, he presents Georges Rouault (1871-1958) as "the leader of French expressionism." This correlation between the terms and the consequences, especially in Germany, and an irrefutable conformity of outlook in Europe, obviously justifies the inclusion of the Fauves, in the general movement of expressionism. But when considering the strictly pictorial techniques and profound intentions of expressionism, their presence would necessarily appear rather dubious if a certain amount of interplay between the two movements had not taken place: indeed, as regards the Fauves, the difference between their expressionist style and what was really German expressionism is very clear. It is, in fact, natural to regard the foundation in Dresden in 1905 of a group aesthetically very close to Fauvism, Die Brucke (The Bridge) as marking the decisive change in Germany's cultural life. The initiative came from a student of architecture, Ernst Ludwig Kirchner (1880-1938), who was joined by other young artists: Fritz Bleyl (1880-1966), Erich Heckel (1883-1970), and Karl Schmidt-Rottluff (1884-1976). Though older, Emile Nolde (1867-1956) also mixed with them, before abandoning them eighteen months later. Max Pechstein (1881-1955), from 1906 to 1912, and Otto Mueller (1874-1930) from 1910, were also of their number. This group broke up in 1912, and officially dissolved in 1913. Now, if, like the Fauves, they claimed affinities with Van Gogh and Paul Gauguin, they were quick to distance themselves from them in the significance they granted to the pictorial qualities of art. Whereas the Fauves inherited from Gauguin the use of vast flat tints of colours, and were interested primarily in decorative art, Kirchner and his friends maintained the importance of the intellect, and were not simply concerned with form. They sought to emphasize the profound presence of nature. Exacerbation and ruggedness were designed to convey above all a sense of original communion. Certainly, this sense of primitivism was one of the major phenomena of the beginning of the century. International co-operation between painters was at that time frequent and fruitful, and in Paris, as in Dresden and Munich, primitive art was rediscovered. But Die Brucke was based on a philosophical program, prefiguring the general movement towards a revival in the arts that became German expressionism. This program expressed the need for a collective ideal, a desire to break with the past, a messianic view of art and exalted intuitive creative powers. Influenced by the philosophers Nietzsche and Bergson, it appealed to artists to allow themselves to be carried away by the vital sources of the elements. A vague desire to transform the existing order was combined with an individuality that exalted the creative impulse. This situation, for which Kirchner is responsible, can be seen in the many pictures composed by the Die Brucke painters. A reality charged with meaning for the community was impregnated with a religiosity or symbolic significance. This is also the distinguishing feature of the Fauves. The artist did not simply mirror the age he was living in: beyond the anecdotal subject, there had to be a universal human truth. At the end of 1911, at a time when the Die Brucke movement was beginning to break up, another group emerged in Munich, called Der Blaue Reiter (Blue Rider) centered around Franz Marc (1880-1916), Kandinsky and his partner Gabriele Munter (1877-1962), and Alexei von Jawlensky (1864-1941) the "Russian Matisse", along with other talented painters like Lyonel Feininger (1871-1956). Like Die Brucke, the group reacted against naturalism, against Impressionism, and insisted on the instinctive forces of the artist. As for the Der Blaue Reiter artists, a return to man's origins haunted Kandinsky's circle. There was an anti-materialist and especially anti-positivist reaction, which led to a literary interest in mystical thinkers and which also claimed to include a certain element of primitivism. In 1912, Der Blaue Reiter published an almanac in which the illustrations, which were carefully chosen by Kandinsky, alternated between pictures and numerous popular prints from Russia, China, Borneo, Cameroon, Easter Island and New Caledonia. In fact, a mood shared by practically an entire generation of intellectuals was born in approximately 1890 and developed from 1911 onwards. That year, the new aspirations began to break out. In June, Kurt Hiller opened in Berlin his Cabaret Neo-Pathetique. Jakob van Hoddis suddenly became famous by reading a poem there, called End of the World, which was felt to mark a crucial turning-point. Something as yet ill-defined was glimpsed. There was a desire to break with the past. All conventions were overthrown in order to reach out towards a new world which they could already foresee. People gathered around reviews that publicized their revolts and aspirations. In fact, when the word expressionism itself was coined, it provided a focus for their feelings, which had been in gestation for decades and which destroyed everything that was in their way. Previously, when talking about the subjectivity on which the aesthetic common to the expressionists was founded, we have intentionally used examples dating from before 1912: fragments of Bebuquin by Carl Einstein were published in 1907. The Assassination of a Buttercup is a short story written by Doblin in 1905. Oskar Kokoschka published the first version of Murderer, The Hope of Women, in 1910. It was on 3rd March 1910 that the most famous of the avant-garde reviews (and galleries), Der Sturm, brought out its first number. It was founded by Herwarth Walden (1878-1941), who was a critic and a leading artistic figure. From 1903, he represented this new mood, with 1910 marking its real rise to popularity. By bringing together painters and young writers, it tried to achieve a synthesis of the arts. It gave details of existing artistic movements, like Futurism and Cubism, and provoked general reflection on aesthetic problems: Franz Marc, Hans Arp and Kandinsky all elaborated theories which have greatly added to our understanding of modern art of this period. In addition to the review, in March 1912, the Sturm Gallery Berlin was opened, and inaugurated by an exhibition of Der Blaue Reiter. A year after the founding of Der Sturm, another journal - called Die Aktion - came out which, as a competitor, for ten years successfully reflected the mood of a generation in revolt against its age. Franz Pfemfert, its director, defined it as a politico-literary weekly. His avowed aim was to combat pitilessly and tirelessly what he called "aculture", or barbarity. He claimed it was a difficult battle, in so far as the impression one had was of being carried away in a whirlwind of triviality that threatened to swallow one up. "The absence of a soul is the destructive sign of our age. To be an individual is to have a soul. The age we live in does not recognize individuals." The soul, the mind, these are the key words that insistently crop up everywhere. It was essential to restore the individual in all his creative power, to destroy the shackles imprisoning his imagination. It was against soulless reality that part of German youth rebelled. What it rejected was the enslavement of the mind. It attacked the machine age, the ruling moral values. It wanted to regenerate the human condition. By bringing together all the means and the power of art, the hope was to achieve a renaissance of society. The revival of the arts which was achieved through the destruction of concrete reality, and in favour of the creation of a re-humanized reality, implied a moral reform of society. Franz Marc, in an introductory article for the second almanac of Der Blaue Reiter, which was not published in the end, expressed perfectly this link, that was established by the expressionists, between their artistic endeavours and the social meaning that they attributed to them. The creative adventure lay in a complete break with the world of the past: "It is by taking this action that we will live up to the great challenge of our time. It is the only activity that makes living and dying worthwhile. An action which implies disrespect to the past. But we want something different; we do not want to live like happy inheritors, living off the past. And even if we wanted to we could not. The legacy is now redundant: continuing the past makes the world vulgar. This is why we are in the process of advancing into new domains and living through a great upheaval where everything has still to be achieved, to be said, organized and explored." Considered from this point of view, German expressionism by far transcended the idea of an expressionist style. Despite the innumerable programmes to which it gave rise, it did not present, moreover, the coherence of a literary and artistic school. If it was a movement, it was because it influenced all aspects of life, and not because it relied on a framework of principles like Futurism or Surrealism. It is impossible to limit it to an aesthetic movement. The subjective individualism which was its foundation rejects all restrictions and taboos of every kind which might have constrained its initiative. It necessarily increased its means of expression by favouring, on everybody's behalf, the blossoming of man's most inner originality. It is not surprising that many expressionists were tempted ideologically by anarchism, or that they were admirers of Nietzsche. In expressionism, a vision of the world prevailed; it presented necessarily disparate images depending on the groups and even individuals, but it is part of a particular period of history, namely that of Germany from 1910 to approximately 1925. First of all, expressionism was inseparable from a feeling of crisis. This was lived through and expressed by all the representatives of the generation who were beginning to write, paint and produce plays between 1905 and 1914. What they felt was a disquiet, an impossibility of self-realization, a dissatisfaction with the reality they had before their eyes. They suffered the consequence of the increase in the industrialization of Germany, which found its moral foundations shaken. Fragile human relationships, the frenetic pace of life in the towns, slavery of every kind, were the norm. As proof against the endeavours of the individual, this reality showed itself to be a formidable machine to destroy. It had to be killed off. This was what emerged in their works, through their themes and their forms. There was a real generation gap, a conflict between father and son, that was illustrated in expressionist drama. They defended revolt. They were against the family, teachers, the army, the Emperor, all the henchmen of the established order. Solidarity, on the other hand, with all humiliated souls, those on the fringe of the system, the congregation of the oppressed, the poor, the prostitutes, the madmen, and the young was advocated. Although this article is devoted to expressionist painting, reference should be made to the two great expressionist sculptors active in Germany in the run-up to World War I. These are the wood carver Ernst Barlach (1870-1938) and the Gothic-inspired Wilhelm Lehmbruck (1881-1919). Thrown into the slaughter of the First World War, they had foreseen the horrible cataclysm in striking prophetic visions. The expressionist generation then began to call for the rise of a New Man. From 1916, it inclined in the direction of pacifism (even Hanns Johst, the future paragon of Nazi writers). After the announcement of the end of the world, the Apocalypse, regeneration, reconstruction, were key words. Faced with atrocities, Utopian idealism seemed to many to be the basis for a possible solution. Salvation was not seen in the context of a collective social struggle, in an economic and political transformation of society, but in an inner renewal of Man. Some of the expressionists (Ludwig Rubiner, Rudolf Leonard, Ludwig Baumer, Johannes R. Becher, the activists around Kurt Hiller and his publication Das Ziel) also found in various ways the road towards some kind of political commitment. The revolutionary events that shook Germany in November 1918 left some of them uncertain what to do (Gottfried Benn, Oskar Kokoschka, Paul Kornfeld), but many actively participated: Ludwig Baumer was one of those responsible for the Council of Bremen, Ernst Toller was one of the leaders of the independent socialist republic of Bavaria. The painter Conrad Felixmuller and the playwright Friedrich Wolf were at the battle of Dresden. Wieland Herzfelde and Franz Pfemfert were thrown into prison when the counter-revolution was winning; Carl Einstein was one of the architects of the soldiers' Council at Brussels in November 1918. Herbert Kuhn, in 1919, saw in this type of commitment, which often had a religious and mystical dimension, a logical extension of expressionism: "There is no expressionism without socialism. It is not a coincidence that Art Nouveau was so vigorously open to politics." Yvan Goll, in 1921, made a statement that went in the same direction: "Expressionism is the literature of war and revolution, of the intellectual struggling against the powerful, the revolt of the conscience against blind obedience, the cry of the heart against the thunder of massacres and the silence of the oppressed." These opinions were uncompromising and not all those who were regarded as expressionists shared them (e.g. Herwath Walden, whose political evolution in the direction of communism dates from the end of the twenties, and who, at that time, was opposed to all politicalization of art). Even among those who shared them, a number of ideological varieties existed. But what is certain is that the revolutionary failures only hastened the break-up of the movement. Its failure and its demise began in 1919-20. Some became embittered and succumbed to irrationality, others adapted to the climate of the times. The latter group formed revolutionary political organizations, in particular becoming members of the German Communist Party. The beautiful dream of the new Man had definitely collapsed. It was historical conditions, without a doubt, that determined the outcome of German expressionism. Already almost exhausted, another crisis slowly brought about its death: the inflation and the misery of the post-war period. The communion between artists and the masses was over. Germany was hungry and shattered. Actors were on strike because their salary was only worth two pairs of shoes. The same generation, after the collapse of its humanitarian aspirations, also witnessed the collapse of the ability to create, because of economic constraints. Another age was beginning: that of a return to order, marked in literature and painting by what has been called New Objectivity (see: Die Neue Sachlichkeit), a tendency to which Felix Berteaux, a renowned journalist of the post-war period, very pertinently gave the name of 'rigid order'. [But see the highly expressive realism of German postwar painters like Max Beckmann (1884-1950), Otto Dix (1891-1969) and George Grosz (1893-1959)]. Yet expressionism did not die immediately. Its last sparks continued for a few more years, especially in the theatre with the productions of Leopold Jessner, or in the cinema with Carl Mayer's scenarios. But its fundamental aspirations were a thing of the past. Only its principles and artistic techniques remained, until they became a fashion that no longer corresponded to the famous inner need to create that Kandinsky had spoken of, and which led to an aggressive snobbery. Broken lines and forms, disharmonies, dissonances, aggressive colours, and artificial recourse to primitiveness, all these methods were only used to provoke calculated emotional shocks in the public. Paradoxically, it was precisely those characteristics which were retained to affirm the existence of an expressionist style. It is obvious, on the other hand, that many writers and artists who had lived in the expressionist climate, whilst moving on to another phase of their creativity, retained in their approach something of their former selves. Schonberg's work, for example, had until Moses and Aaron, composed in 1920-32, a pathos about it which was again present in The Happy Hand; it was a long time since Becher had used an explosive and ecstatic language despite his having become a Communist. The architects Erich Mendelsohn, Bruno Taut and Hans Scharoun, for their part, tried not to sacrifice their own personal imagination in the field of urbanism and the construction of buildings. In so far as it was closely linked to the history of Germany and of German society, expressionism in its genuine sense had hardly any following abroad, except in countries which had close relations with Germanic culture. In Hungary, for instance, Lajos Kassak who had contacts with Franz Pfemfert claimed affinities with the expressionist aesthetic, and the journal that he edited from 1917 to 1925, Ma, has at first sight a lot in common, if only because of its external appearance, with Die Aktion. In 1922, one of its collaborators, Sandor Barta, emphasized that his generation had found the path to social reform and a socialism via expressionism. In the Netherlands and in Flemish Belgium too, the intellectual exchanges with Germany likewise made them familiar with expressionist art and reviews, and the Flemish renaissance in woodcuts owed much to German endeavours. Above all, Frans Masereel, when considered beside Joris Minne, Henri von Straeten, Jan Cantre, and Josef Cantre, stands apart, because he collaborated directly with the German expressionists, illustrating works by Becher or Sternheim; moreover, as a result of an idealistic inspiration and a sense of the cosmic, his social commitment and themes such as town and revolt, he shared the aspirations that emerged in the Die Aktion circle. As far as France is concerned, one has to take into consideration the political situation between 1918 and 1925, roughly, the period which saw the emergence of German expressionism. Before 1914 very fruitful relationships existed between painters of all countries, to the extent that Alfred Kubin rightly called it fraternization between young artists. But already, most French intellectuals had lost interest. Faced with Wilhelm II's imperialist policies, anti-Germanic feeling became more virulent. Whereas the new generation in Germany was becoming more open in its attitude towards the outside world, through innumerable international contacts, its French equivalent had fallen under the yoke of nationalism. This is the most important difference of attitude that hindered a possible discovery of expressionism. The war followed, and until 1920 the cultural relations between France and Germany were few and fragile. At the moment when expressionism could have become accessible to the French, it was dying out. The result is that well-established and popular journals hardly paid any attention to expressionism, neither before nor after 1914. Only more modest publications like Clarte, Action, Esprit Nouveau, La Revue Europeenne, devoted informative articles to it or published extracts from expressionist literature. The principal mediator was Yvan Goll from Lorraine, who, because he was bilingual, had collaborated in most of the German expressionist journals. Even the surrealists remained in ignorance of expressionism. Whereas avant-garde painters and poets were widely appreciated in Germany, only the new German cinema aroused any interest in France. In French-speaking Belgium, on the other hand, writers and painters openly professed expressionist tendencies, and were supported by journals like Lumiere, Resurrection, L'Art Libre, Selection, and Ca ira. Whatever their differences, for them expressionism was modern art par excellence. Two principal trends existed, corresponding to the division between Der Sturm and Die Aktion. On the one hand, articles by Andre de Riddler, and painters like Constant Permeke (1886-1952), or Gustave de Smet (18771943), betrayed a humanitarian tendency. On the other, with the critic George Marlier and a painter like Paul Joostens, a predilection for non-objective art emerged. Claims of wholehearted expressionism, and no longer simply a bowdlerized form, were made in other countries in the 1920s. In Flemish Belgium, Paul van Ostaijen is an example, along with the journal Het Getij (1916-24). In Yugoslavia there was the Belgrade group centered around Stanislav Vinaver, who was the author, in 1911, of an expressionist manifesto. In 1919, in Russia, Ippolit Sokolov published a book-manifesto, Bunt-ekspresisionista, as did the painter Matthis-Teutsch in Romania a little later. In Poland, expressionism was brought to the fore by the Zdvoj group, and in Czechoslovakia by the Osma group. Finally, in Latin America, it was the subject of a number of articles and debates, concentrating as much on art (in Mexico with Diego Rivera (1886-1957), Jose Clemente Orozco (1883-1949), David Alfaro Siqueiros (1896-1974) in Peru, with Sabogal and Coresido, in Brazil with Anita Malfatti, who had studied in Dresden and Berlin) as on literature, since it was even claimed that the modernistic movement had had in its first period (1915 to 1930), expressionistic overtones. After this far too brief summary, the principal question still remains: how relevant is expressionism today? When one restricts oneself to considering it as a style devoted exclusively to the visual arts, it is clear that it is very much alive: Abstract Expressionist painting in the United States, Art Informel in France, the Cobra group in the Netherlands, and many others have to be considered a part of it since 1945. Since the 1970s we have also seen expressionism influence contemporary art across Europe, with the emergence of the parent style of Neo-Expressionism and its variants Neue Wilden (Germany); Transavantguardia (Italy), Figuration Libre (France). In America, the style was referred to as energism, and included Bad Painting and New Image Painting. But what about expressionism as a general arts movement? Along with futurism and surrealism, both of which also aimed at being applicable to all the arts, it belongs to what is generally called the historical avant-garde. In this capacity, it only began to be rediscovered in the 1960s. And more and more it has been noticed how much still remains to be said about it. For it represents both the genesis of modernism, leading to a social art, verbal experimentation, pictorial abstraction, a synthetic drama, contemporary dissonant music, and the meeting point of all the living tendencies of the age. No other -ism of the century has been so involved in the collective and individual conflicts of its time; none has tried so hard to reach the heart of its contradictions in order to try and overcome them. Expressionist paintings can be seen in most of the best art museums around the world.